Chinook, the county seat of Blaine County is located on Lodge Creek, where it empties into the Milk River. Our town's name comes from an Indian word meaning "warm wind," and it is this wind, melting the snow in January and February, that makes it possible for cattle to reach the rich grasses and survive. Chinook winds have saved many a cattleman from disaster. It was Charlie Russell's postcard picture of a starving range cow, "Waiting for a Chinook" (also called "The Last Five Thousand"), that first won him recognition early on as an artist. While you are in town, be sure to visit our many attractions. The Blaine County Museum features area history and artifacts with an emphasis on the homestead era. Native American artifacts and culture make up an important part of the museum's collection, together with early photographic records of Nez Perce life. Military and Nez Perce artifacts from the Bears Paw Battlefield are on exhibit. The battlefield should be on your itinerary. Interpretive signs and markers line the foot path through the battlefield - you won't want to miss this great exhibition! The Blaine County Wildlife Museum offers an excellent display of animals native to the area, click here to visit their website. The Bears Paw Battlefield is the site of the last major Indian battle in the United States, which is located just 16 miles south of town on Route 240. It is one of Montana's three units of the Nez Perce National Historic Park. The Battlefield is the site of the surrender of Chief Joseph and the Nez Perce Indians on October 5th, 1877. After a 1,700 mile retreat, Chief Joseph made his famous speech of surrender: "From where the sun now stands, I will fight no more, forever." Our town has remained nostalgic for hundreds of years and is located just 20 miles from Havre, Montana: a larger community on Highway 2. Our population is around 1500 and we have numerous beautiful parks. Chinook once was home to a massive Sugarbeet Factory, which in fact, is the reasoning behind our "strange" mascot. According to Jay Leno, it ranked number 2 out of 100 "strangest mascots" in the U.S. Oil and gas discoveries have also from time to time, given our economy a boost, yet the major industry still remains agriculture. Downtown Chinook has seen some growth in the last few years. The area has been very well kept and is a beautiful sight to see with all the trees and lush greenery. Numerous old homes have also been renovated in Chinook, adding a "touch of class" to the town. Our town is also very functional, while you won't find a retail "box" store, Chinook has all the basic stores that a small town needs to have. Click here to see a full member business directory. We would like to thank you for visiting our website and encourage you to come and visit us. Our town is truly as nostalgic as it seems, and you won't be disappointed. Be sure to email us with questions, or check out the great links on this website to help you navigate your trip to Northern Montana. We have created an app for the area! This will be replacing the coupon book and be a huge help to tourists and neighbors. The app has coupons for the Chamber Members, business listings, attractions, sponsors, and calendar of events. It is on the Google Play Store now! Should be available on the Apple Store within a week! The advertisements on this page are Paid Advertisements. Contact us to place an affordable ad on this website. The Chamber meets monthly and we would like to welcome you to our community meetings. Give us a call and we'll be happy to show you around and introduce you to the community. To see a full list of our members, click here. Please support them as they support your community! 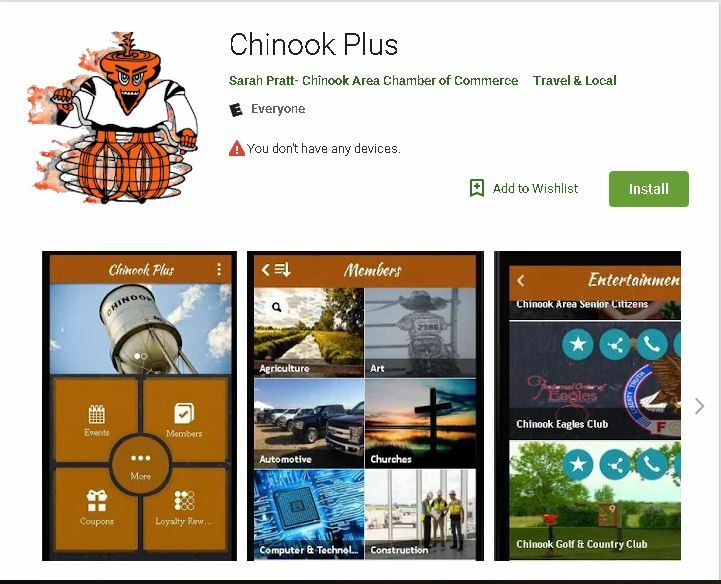 The Chinook Chamber of Commerce sends periodic emails informing the community of events and happenings in the area as well as meeting notifications, awards and more.